The Audi e-tron is one of the first non-Tesla skateboard vehicles to hit the market. For most of automotive history, vehicles could be sorted into one of two categories based on how they were built: body-on-frame, such as today's full-size pickups and big SUVs, or unibody, which includes almost everything else in the market. Body-on-frame and unibody construction are not going anywhere anytime soon, but the development of battery-electric vehicles from Tesla and others has introduced a third manufacturing method — one offering designers far more freedom to experiment while helping automakers save money through commonality. It's known as the skateboard, and it was developed almost two decades ago by forward-looking engineers at General Motors. Now it's the method used to build Teslas as well as the Audi e-tron, the first of 70 full-electric models Volkswagen Group plans over the next decade, accounting for 22 million vehicles globally across its 12 brands. The e-tron, an electric crossover, is to be one of the first non-Tesla skateboard vehicles to hit the market. It is being rolled out across Europe now and is scheduled to begin arriving this month in the U.S. Built in Brussels, the e-tron is built in two sections that are mated together in a process far closer to body-on-frame than unibody construction. The lower section, or skateboard, is built around a 710-kg (1,565-pound) enclosed battery pack composed of 36 power modules in a welded aluminum spaceframe. Individual modules are connected with almost 3.9 km (2.4 miles) of wire across 600 electrical connections to deliver electricity from the 95 kilowatt-hour battery pack, which is about the size of a double bed. Attached to the power pack are two or three electric motors, depending on the performance level, mounted to the rear and front axles. 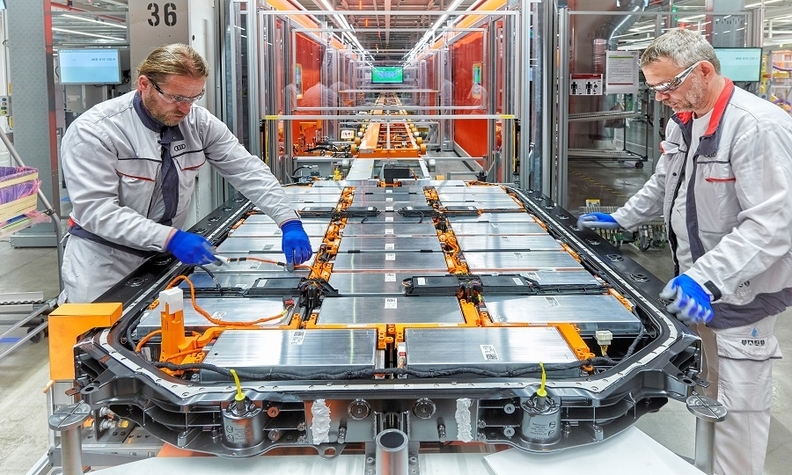 On a parallel assembly line in Brussels, the other half of the e-tron is built in a way that would look familiar to anyone who has worked in or toured an auto assembly plant. The top half of the two-row performance crossover goes through body, paint and initial trim before what is known in the plant as "the marriage." The upper and lower halves of the e-tron are slowly combined, with the skateboard's four raised suspension elements carefully guided into their places in the top hat. The two assemblies are joined together using a series of flow-drill screws. Most of the marriage is done automatically by robots, while humans are needed to align the suspension elements. 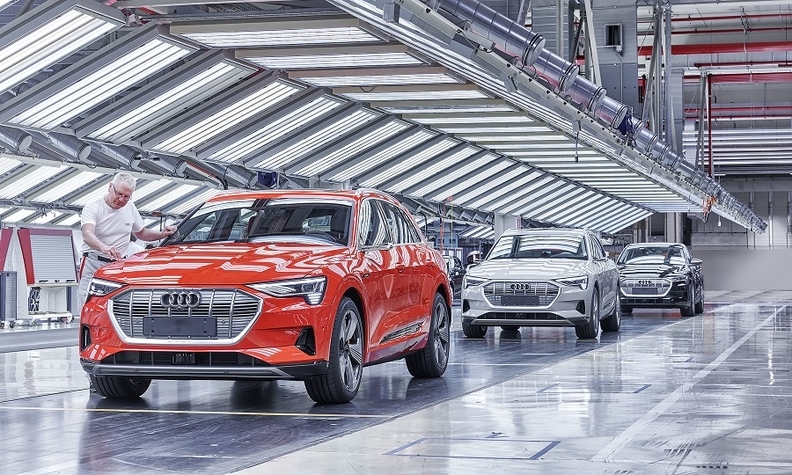 After the two halves of the e-tron are married, the vehicle is sent to final trim before being shipped to dealers worldwide. The e-tron's lower section, or skateboard, is built around a battery pack in a welded aluminum spaceframe. It's then mated to a top half that goes through body, paint and initial trim. For an automaker such as Volkswagen, which has broad battery-electric plans, skateboard manufacturing is key in terms of flexibility and scale. VW's two main skateboard full-electric platforms — MEB for mass market cars and PPE for performance-oriented vehicles from brands including Porsche and Audi — are flexible enough for designers to customize size and characteristics across various vehicles and even segments. In Volkswagen's plans, for example, the Golf-sized ID, the ID Crozz crossover and the retro-styled version of VW's former Microbus called the ID Buzz will ride on versions of the MEB platform.